1. Spray a 12- cup Bundt pan with vegetable cooking spray. Sprinkle pecans in bottom of pan; set aside. 2. Combine 2 tablespoons butter, 1/4 cup SPLENDA Brown Sugar Blend and 1/4 teaspoon cinnamon in a small saucepan; cook over low heat, stirring constantly until blended; pour mixture over pecans. Set aside. 3. Combine 1/3 cup SPLENDA Brown Sugar Blend and 1/4 teaspoon cinnamon in a small bowl; set aside. 4. Cut each roll into half; dip tops of balls into melted butter and then into SPLENDA Brown Sugar Blend mixture. Place in prepared pan. 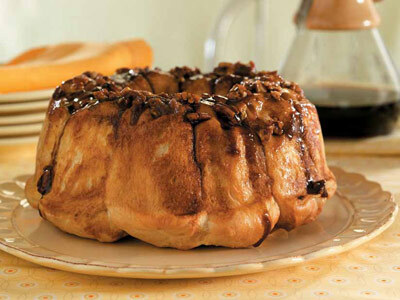 (At this point Monkey Bread may be covered and stored in the refrigerator 8 hours or overnight or proceed as directed). Cover and let rise in a warm place, free from drafts, 50 minutes or until doubled in bulk. 5. Preheat oven to 350 degrees F about 10 minutes prior to baking. Bake 25 to 30 minutes or until bread sounds hollow when tapped. Remove from pan; cool on a wire rack. Serve warm.